One year ago, Lafayette Jeff’s 400 meter relay squad emerged from Lane 8 at the state finals to achieve an improbable fourth-place finish. 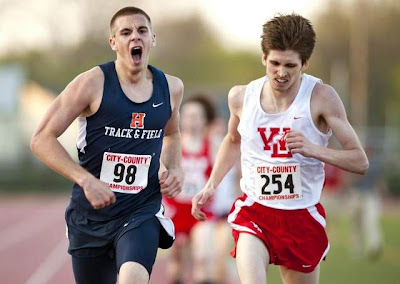 Later that day, Lucas Wallace stunned the state again with a championship performance in the 200. That breakthrough set the stage for an impressive 2013 for the Broncho sprinters. Darian Green, Matt Johnson, Carl McQuay and Wallace team on a 400 relay that hopes to contend for a championship at Friday’s state finals in Bloomington. Johnson, McQuay and Wallace are also contenders for individual championships, and their efforts could put Lafayette Jeff in position to contend for a team trophy. Unlike other marathon training programs, which typically have runs of 20 miles or longer, the Hansons method tops out at 16 miles, an appealing draw. But the training is hard, with runs six days a week, and midweek runs stretching to 12 miles. The purpose is to train on tired legs, to get you ready for the last 16 miles of the race, and not the first 20. 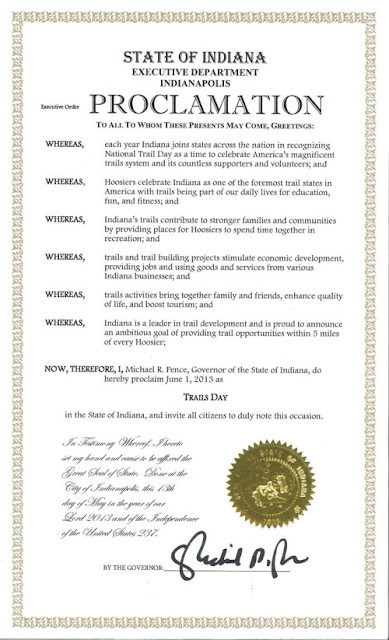 TIPPECANOE COUNTY, Ind. (WLFI) - The date is set for the second-annual Tippy Mud Run. The intense 5K obstacle course is now scheduled for Sept. 22. Proceeds benefit Junior Achievement, an organization devoted to helping more than 8,000 local school children learn about finance and economics. This year's run will take place at the Franklin Carey Boy Scouts camp. "It allows people to come and enjoy a scenic route, there's going to be a lot of trail running but there's also going to be a lot of obstacles, some of which are going to be by nature that we'll have to maneuver through," commented Angela Hileman Director of Development for Junior Achievement. Registration is $50 for adults and $45 for students. our First Annual 5K Rock and Run/Walk! Located in the beautiful woods of Owen County, Indiana, this 5K will take place throughout the trails of Stable Studios and our surrounding neighbors. Along the trail we will have musicians to entertain, inspire and excite! In addition to the musicians on the trail, Stable Studios will feature two (2) live bands on our main stage beginning at NOON! Stable Studios will also be donating proceeds of this event to Music Programs in Indiana, starting with Owen County! Parking and Primitive Camping are included in the registration fee. Anyone wanting to attend, but not participate in the 5K will be charged a $10 fee (this includes parking and camping). No refunds.You can register the day of, however, you are not guaranteed a T-shirt and must arrive 20+ minutes in advance. This is a trail run/walk, strollers are not advised. No bikes, ATV's, Golf Carts or otherwise. Beverage, food and merchandise vendors will be available during and after the race. Stunning terrain, challenging hills, and meticulously constructed trails. The rewards of running in the Qdoba DINO Trail Run at Brown County State Park! The Brown County event has become one of the series' most popular venues. This is the only course this year with mile-long climbs and downhills - much different than the other races in the series. The course starts uphill for the first mile before flattening a bit. The 5k heads back downhill for a mile-long downhill to the finish. 15k will make a left turn that sends runners onto a loop containing several long climbs and descents. 15k will finish with the same long downhill as the 5k. Make it a weekend! There's plenty to do for family and friends, including swimming pool, camping, hiking, and nearby shopping and attractions of Nashville . Most of the race course is on the mountain bike trail, which will be used the following day for a DINO Mountain Bike Series event. Subject to minor changes. All races will be Eastern time. Indiana does observe daylight savings time. Gate fee of $5 per vehicle ($7 out-of-state) will be required as you enter, or you can purchase an annual entrance pass and enjoy any State Park all year long. You can purchase your annual pass ahead of time. Camping: Onsite at the park's large campground. Reservations are recommended - www.camp.IN.gov or 1-866-6campIN. Cabins and Abe Martin Lodge also available: www.indianainns.com or 1-877-lodges1. 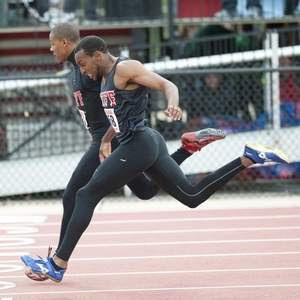 For the final time, Lucas Wallace and Carl McQuay emerged from the northwest corner of the Scheumann Stadium track and pulled away from their 200-meter dash competitors. The Lafayette Jeff seniors ran shoulder to shoulder over the final 50 meters, neither backing down, as if running against his fiercest rival. Per custom, Wallace edged McQuay by four-hundredths of a second, breaking a 15-year-old regional record in the process. 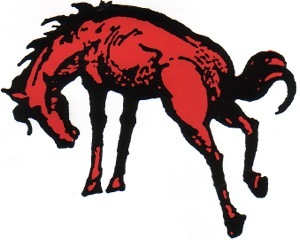 It was one of four Lafayette Jeff Regional championships for the Bronchos, who plan to cap their careers with one more memorable performance at the state meet at Indiana University next week. Congratulations to all the local runners and Good Luck next week at the State Finals! Over the past few years, Lafayette’s Omar Vasquez hasn’t had the best luck when it comes to aggressive dogs. An avid jogger, Vasquez said he has been bitten once and avoided what he called “near bites” on two other occasions. A dog owner himself, Vasquez isn’t sure why some canines he comes in contact with seem to be gunning for him. “Maybe it’s my cologne,” he said jokingly. “But yeah, when it gets hot a lot of people just let their dogs out in their yards without a leash or anything. I jog by and they yell out ‘Don’t worry, he won’t bite’ or ‘He just wants to play.’ Next thing I know they’re running after me. These encounters will are bound to happen. Please use common sense when being approached by strays or someone's pet that has momentarily escaped. Actually, strays tend to be a little more street savvy and will likely avoid you. But, it's the household pet that is temporarily unrestrained that I've seen as the issue. The dog, newly free, doesn't quite know how to act and may act inappropriately without the regular guidance it gets from its owner. And, there is also the fact that some people are poor dog owners, mistreating or neglecting their dogs. You never know what the dog has been through with the contact it has had with humans in the past. The dog may see you as being the same as that mean person that hits or kicks him at home. Please be extra on guard if you are diminutive in stature or you have a child with you or your own pet. By nature, the unrestrained dog may be drawn to the smallest (and easiest) "target". In the article, the suggestions provided to avoid dog bites include not breaking up a dog-on-dog fight by hand and carrying a stick with you when you are out in addition to avoiding direct eye contact. - make an effort not to back down; make yourself as big as possible (stand tall and spread your arms); It is true that dogs love to chase things. So, make sure the dog is gone before you turn to pick up the pace. - make loud noises/yells; they don't even have to be words, just aggressive yells - telling the dog you may come after him (I've stopped many a dog in it's tracks by stopping, turning towards the dog, spreading my arms and yelling like I'm a bear.) Relatively speaking, I am tall at 6'1". But, ladies, you should make use of this tactic as well. - squirt him with your water bottle and/or wave your hat at him while yelling. - AND, last but not least, the tactic that works nearly every time - Pepper Spray (or it's chemical equivalent - Mace). Dogs sense of smell, I've heard said, can by as much as 600 times stronger than ours. With that kind of a powerful nose, you don't even need to have a direct hit with the spray. But, if you do make a direct hit, the consequences will be even more significant for the dog as usually the spray will get stuck in the dog's fur. Please use this as a last resort as it is really tough on the dog. - also, if you are seriously threatened by a dog while out, call 911 or animal control. It may be the case that you were spared from harm. But, that doesn't mean that the kid riding his bike down the street from you will fare as well. Burgess, West Side relay team also win. Lafayette Jeff junior Martina McQuay faced state-caliber competition all season in the Hoosier Crossroads Conference and other large meets. That forced the Broncho discus thrower to set higher standards from Day 1 and helped her prepare for do-or-die moments like Tuesday's West Lafayette Regional. "I know we're going to be with those top girls, and I've got to push it," McQuay said. "I've got to get up there so I'm with them and I'm not bottom dog. I've got to be top dog." A big storyline in today’s race was the marathon debut of 16 year-old high schoolerAlana Hadley of Charlotte, North Carolina. With attention coming from such outlets as the New York Times, the sophomore with a 1:16:43 half marathon PR was gunning for the U.S. Olympic Trials “B” standard of 2:43, though her coach, father Mark, adjusted that time by 2:00 this morning given the expected warmer conditions. And all was on pace as she came through the half-way mark in 1:22 in third place before the marathon gods decided to intervene. Cleaning up a few details from our race on March 23...this will be brief! In the hubbub of finishing the race, I know I gave some Age Group winners their trophies. But, I still have three left and I think I missed someone. Here are the official AG Winners. If you are on this list and didn’t receive your award race-day, please email me with the best mailing address to use and I’ll send it to you! We posted over 600 photos of the race here, at our club’s website. Feel free to download and use however you wish...they are free to you! Thanks to each of you who wrote feedback on the CLM at MarathonGuide.com. If you’d like to read these comments and/or post your own, please do so---it’s a huge help to runners evaluating the race in future. I wrote up my report on the 2103 CLM here, on my running blog. 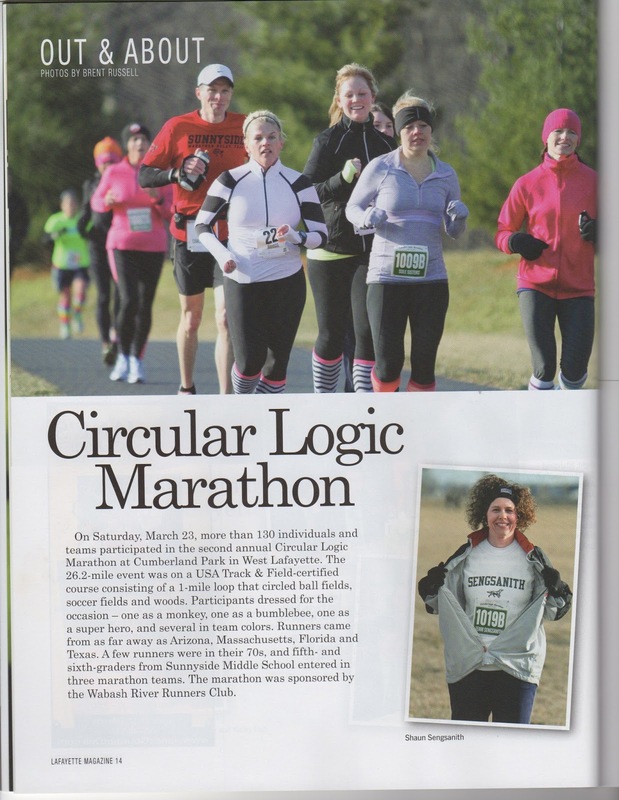 Feel free to peruse or see reports on other marathons I’ve run. .
Next year’s Circular Logic Marathon will be a week later March 29, 2014. We’ll open registration at noon Eastern Time, on Friday, November 1, 2013. We are working on a few fun, new ideas for next year, including gender-specific sizing on T Shirts and some “appropriate” extra bling for those of you who have run multiple CLMs. Our web site will have details as they emerge. Have a great summer of running!! I hope we can see you again next March! 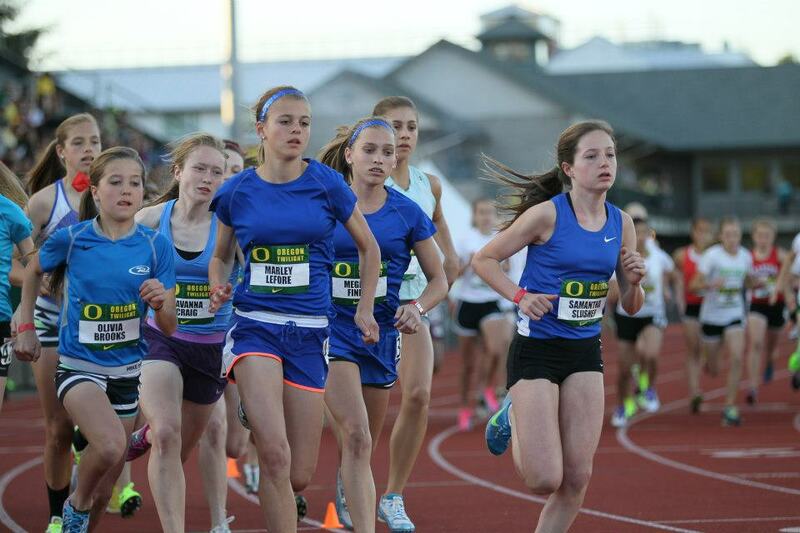 Mary Cain: New Junior & HS record in the 1500m! USA Track & Field shared Flotrack's photo. Each impressive time that flashed on the Scheumann Stadium Jumbotron Thursday night triggered a similar reaction at the Lafayette Jeff Sectional. The crowd typically responded first with a gasp, then applause. From Matt Johnson in the 100-meter dash to the Broncho 400 relay squad to Lucas Wallace in the 200, Lafayette Jeff's sprinters gathered in the infield to exchange exclamations of surprise and congratulations. Lafayette Jeff won eight events and totaled 146 points while winning its ninth straight boys team championship under coach Larry Griggs. West Lafayette, which had upended the Bronchos to win the City/County title earlier this month, finished second with 128. Opinion is divided about whether teens should run marathons. Alana Hadley of Charlotte, North Carolina is just 16, but she travels frequently to large road races around the nation. She was fourth in the Mercedes Half Marathon in Birmingham, Alabama on February, although, as an impetuous teenager might, she “went out too fast the first half … and faded pretty badly at the end,” as she writes on Facebook. 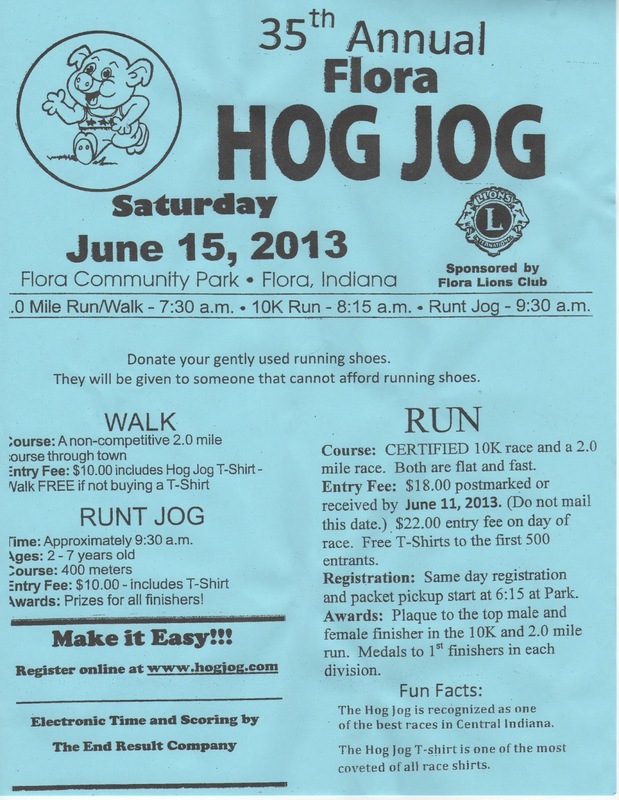 Legal Aid Corporation of Tippecanoe County non-profit group to host 5K run-walk benefit Saturday, May 18 at Tippecanoe County Amphitheater Park. Malachi Baker’s track meet itinerary takes him from one corner of the stadium to the other and back again. 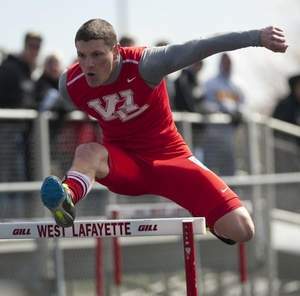 When he’s not dominating the pole vault, the West Lafayette senior bounces between throws, jumps and sprint events. But Baker, who maintains a cheerful and outgoing disposition through that hectic schedule, says the biggest challenge is just making sure he keeps changing his shoes. The area’s top pole vaulter will compete in three other events at Thursday night’s Lafayette Jeff Sectional, and he’s thinking about utilizing his versatility as a decathlete in college. 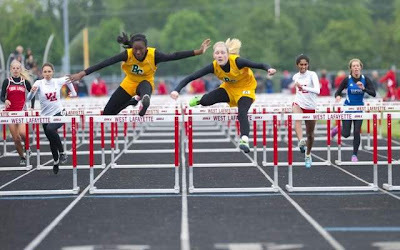 By Tom Baugues/ for the Journal & Courier Katie Bittner from West Lafayette High School clears a hurdle in the 100 meter hurdles Tuesday night in the girls sectionals at Harrison High School. West Lafayette's girls track team loves to pile up big points by winning the relay events. Yet some of the Red Devils'400 relay members surprised even themselves whn they joined the victory party at Tuesday's Harrison Sectional. 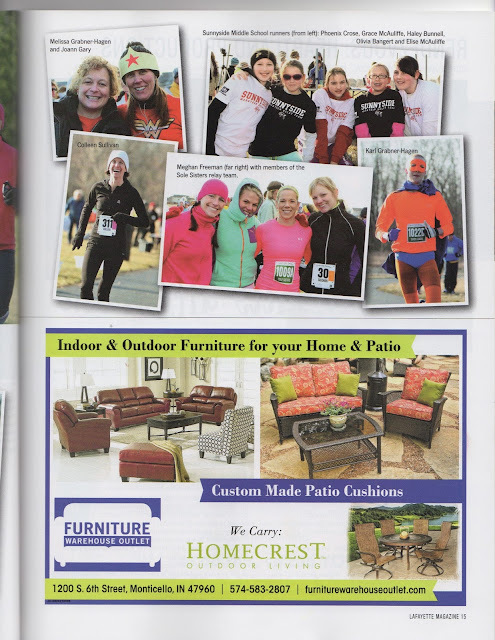 In the "Health & Fitness" section of the same magazine that has the CLM info, Wabash River Runners Club Secretary Nancy Weinburg is quoted as to the virtues and benefits of getting outside this summer and running. Thanks, Nancy. Now, another reason to pick up a copy of the magazine! In the section of the quarterly magazine entitled "Out and About", focus is put on the WRRC's Circular Logic Marathon. Mention is also given to the Sunnyside Marathon Relay teams. 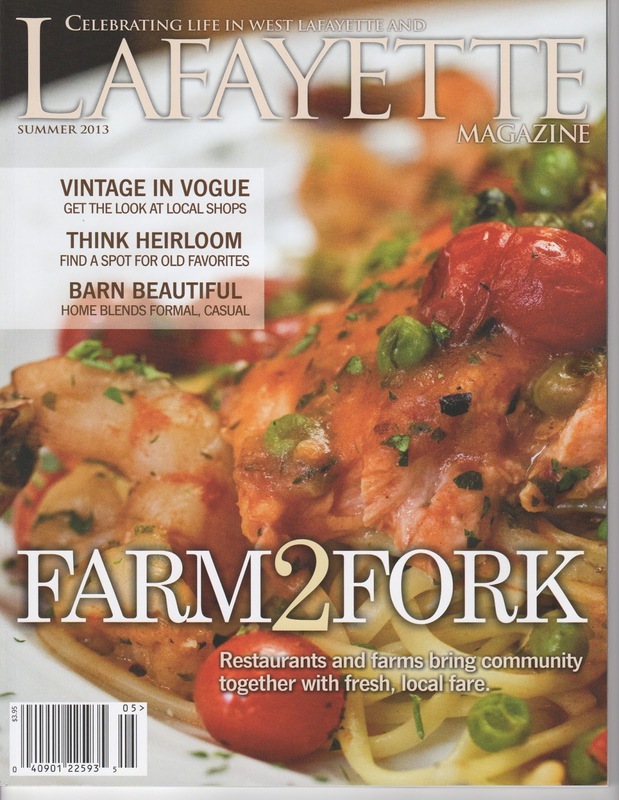 Check out the photos below and be sure to pick up a copy. 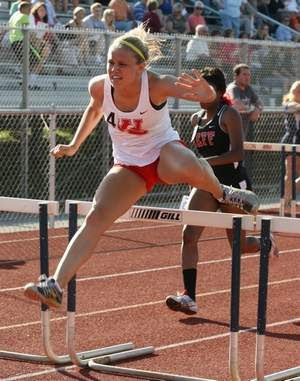 Since seventh grade, Britney Cooper has known who she has to beat most nights to win the hurdles events. Likewise for Evonnie Payne. The Benton Central sophomores have echoed the same message to each other for four years. “Before each race, we look at each other and we say, “First and second,’ ” Cooper said after Friday’s Hoosier Conference meet. WEST LAFAYETTE, Ind. (WLFI) - Running seems to just run in the Daluga family. West Lafayette residents, Dan and Sue Daluga have four children: Drew, Derek, Linsey, and Cailey. All four siblings competed in track or cross country at some point during their lives. 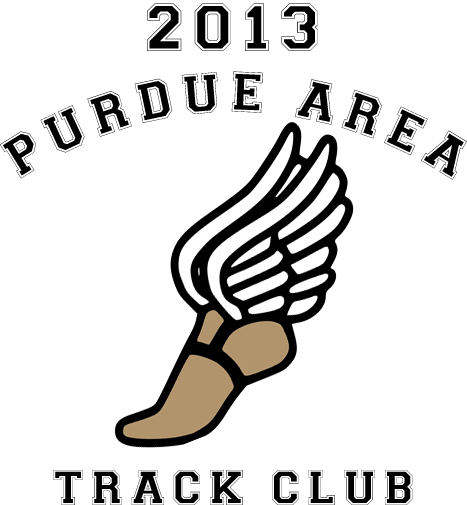 Drew, the oldest and a medical student in Indianapolis, began what would become a tradition among the children, when he competed in track and cross country at West Lafayette. Thanks, Dalugas, for the inspiration and the great example! There's aerobic and anaerobic... and there's also phosphocreatine. Interesting bit of trivia about energy use during exercise, from a new paper in theEuropean Journal of Applied Physiology by researchers in Portugal. We (i.e. 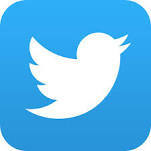 endurance-oriented folks) normally think about two different types of energy production: aerobic and anaerobic. Aerobic is what dominates for longer, lower-intensity efforts, where your hearts and lungs are able to keep pace with the oxygen demands of your muscles. Anaerobic comes into play for shorter, higher-intensity efforts -- and we usually associate it with lactate, which is a by-product (as well as a fuel) in the reactions that produce ATP without oxygen. A 2 mile run/walk and a 10K race, this event is a summertime favorite. Thanks for giving us an example of how to overcome. With one championship in hand and half a lap to go for another at last week’s City/County track meet, Harrison senior Jacob Payne needed to dig deep. Having recently returned to competition from a stress fracture that hampered Payne’s training, endurance was still a work in progress. So the three-sport athlete relied as much on guts as lungs or legs. 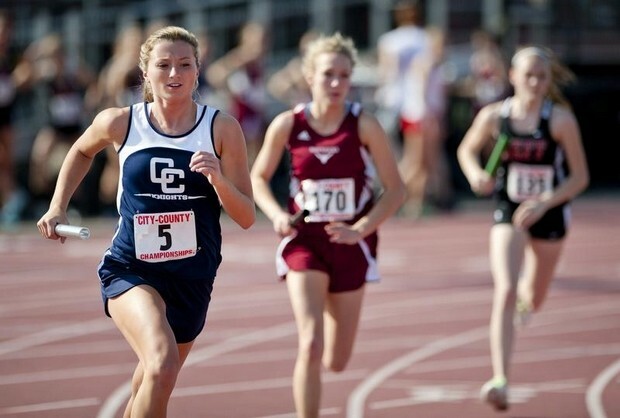 Go to the Journal & Courier's photo gallery and check out the great shots from last week's City/County Track Meet. Great Job Runners and really nice photos. 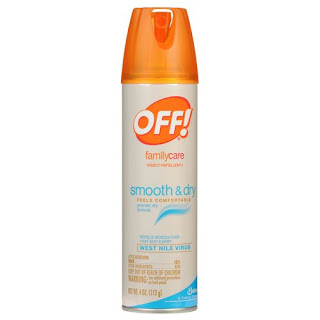 Consumer reports has some valuable information on the brands of insect repellant they've tested. The best advice for runners taking to the trail as to insect repellant pretty much goes hand-in-hand with hydration tips for a long run: early and often. 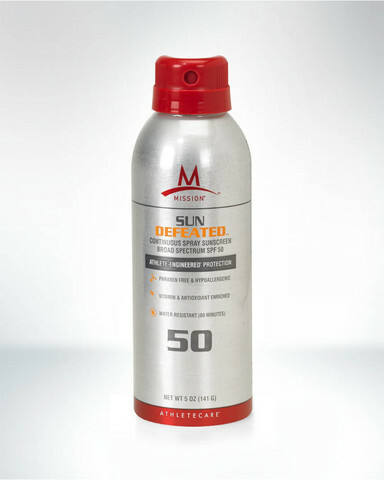 Get the spray on before you start and if you plan on being out for a number of hours, it doesn't hurt to reapply. My current favorite is OFF FamilyCare Smooth & Dry (DEET 15%). For all of us that love trail running and who live in the midwest, Lyme disease is a real and serious threat. Keep it in mind when you head out. Remember, somebody really smart once said that "An ounce of prevention is worth a pound of cure." Check out this article from the Journal & Courier. Good luck to everyone running DWD - Gnaw Bone this weekend. 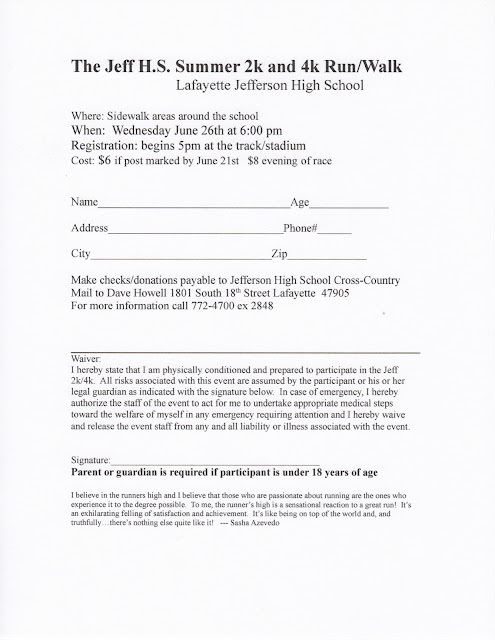 This annual event is put on to support the Broncho Cross Country teams. It is a combination run and walk and has two distance: a 2K and a 5K. As such, this is a perfect event for experienced runners as well as new runners/walkers. Posted to the right is the registration form. Simply right mouse click and print the form. 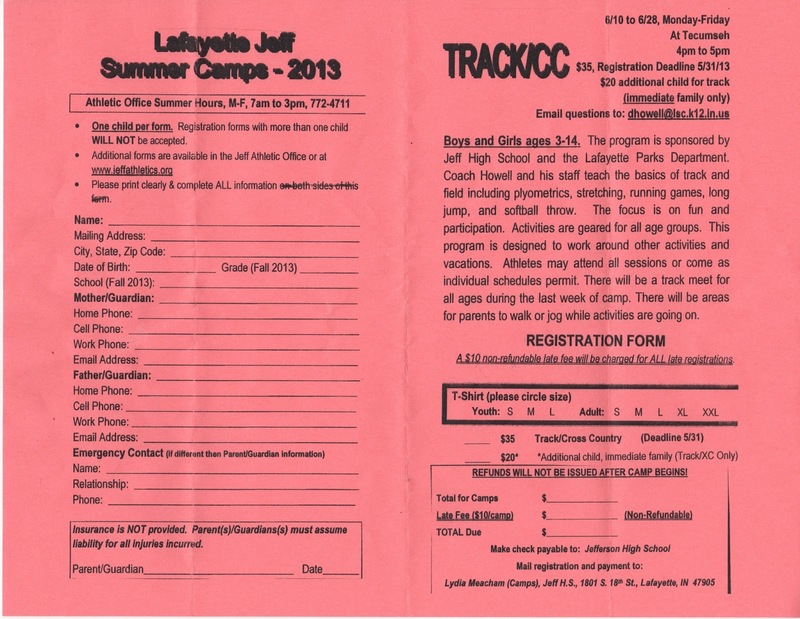 Attention West Side Athletes, Purdue Area Track Club Summer Camp is around the corner. 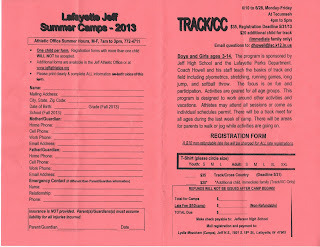 For more info and a registration form, simply print the for posted below. 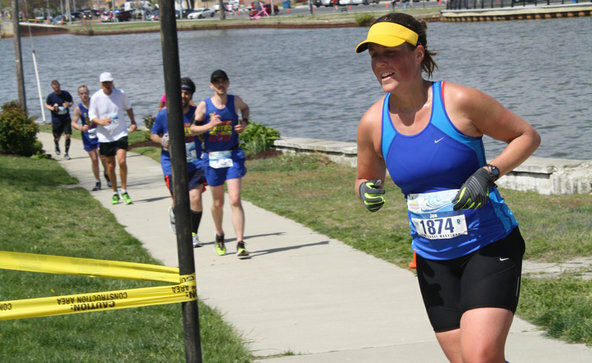 Check out a local runner preparing for some big events this summer. With the recent stretch of temps in the upper 70's, it may seem that we skipped straight from winter to summer. But, a sure sign of spring is the fountain on the west of the pedestrian bridge coming back to life. The photo below was taken just after 6am today. Welcome Spring! BETHESDA, Md. ‐ The American Running Association (ARA) will host and promote its National Run a Mile DaysTM from May 3‐12, the Maryland‐based national nonprofit announced today. “R U A MILER” will be the rallying cry at elementary and middle schools across the U.S. for the sixth annual national campaign. The Mile is the standard measure in America and has been the indicator of fitness in running and track for decades. ARA is supported by its professional division of physicians and allied health professionals who have fundraised to support the national effort to increase the fitness and physical activity levels of America’s youth. 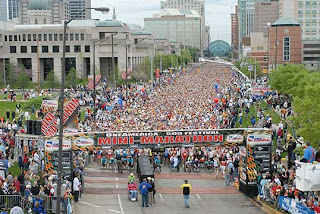 Congratulations to those who have trained and are ready for the 500 Festival Mini-Marathon this coming weekend! The hard part is over. Now, get out there, let all your hard training work for you and have fun. Below is a link to a little Q&A article in the IndyStar conducted with a former elite level runner. She gives her thoughts and tips on the event. You'll know most of this information already. But, it doesn't hurt to take a minute to review it.